*** Jan 29 COMMENTS DUE . As Congress dithers, parties becoming resigned to KBRA’s demise, Capital Press 12/17/15. "(Klamath) tribal chairman Don Gentry: “...We’ve been honoring the KBRA since 2010. It’s been five years, and our native fisheries and Lost River and shortnose suckers are in worse condition now than when we signed the agreements..."
HOWEVER: Reclamation Announces Increased Numbers of Lost River and Shortnose Sucker Fish in the Klamath Project, BOR 12/17/15. "Bureau of Reclamation biologists found the largest number of juvenile Lost River and shortnose sucker fish since fish salvage operations began on the Klamath Project...the late 1990s"
Congressman Walden Press Release: Walden releases draft legislation to help solve long-running water problems in Klamath Basin, asks for input from all parties, 12/3/15 (Dam removal is not part of package). Walden to push Basin water pact; Congressman to sponsor new version of agreement, H&N 10/15/15. "It will likely include the removal of the four dams that sit on the Klamath River and have been a source of dispute among parties who have not signed on to the water agreement." Here is an interesting website > http://www.waldensrecord.com regarding Walden's recent votes. Water settlements urgently need champions, H&N, posted to KBC 9/27/15, is one of the media ploys praising the controversial Klamath "agreements'. According to H&N editor Pat Bushey in a later editorial, in addition to the two farmer guest writers was Curt Mullis was a lead employee of US Fish and Wildlife service for the Klamath Basin involved with endangered suckers. In his bio story praising him is Phil Detrich, who "led the development of state and federal regulations and management for Northern spotted owls....Detrich was the Fish and Wildlife representative in the years-long multi-party settlement talks that led to the two-part Klamath Basin deal...that aims to remove four dams on the Klamath River, restore the fishery...Detrich calls the deal a success only on paper, for now. The future will determine if it saves salmon." California Congressman Doug LaMalfa expresses concerns with KBRA at townhall in Tulelake, by KBC News 9/19/15. "How can I support something that's morally wrong?" asked LaMalfa. Yurok Tribe pulls out of Klamath River agreement, The Triplicate, posted to KBC 9/19/15. KBC NOTE: Environmental activist/current Karuk Tribe spokesman, has stated to a meeting of all the tribes and environmental groups in this video, "we worked with the Klamath Project irrigators, the enemies of the tribes since those guys showed up; we did work out a water sharing agreement. ...We did not solve all the problems in the Klamath Basin with these agreements. We did not get rid of all the farmers, we did not rebuild all the wetlands, but we do pull off the biggest dam removal in the history of the world...and if we're still gonna deal with water quality issues at Keno, at the end of the day, I can guarantee the Karuk Tribe and Craig Tucker will be in the front seat dealing with that next." (KBC NOTE: that refers to destroying the Keno Dam, which provides water to the Klamath Project irrigators). (Klamath) Basin water pact stalled, H&N 7/11/15. " 'Those dams are going to come out whether we have the KBRA or not. Those dams — their days are numbered,' said Craig Tucker, a spokesman for the Karuk Tribe. According to Tucker, receiving blessings from U.S. Reps. Greg Walden, R-Ore., and Doug LaMalfa, R-Calif., is the bill’s biggest hurdle." "According to the website govtrack.us, SB 133 has a 21 percent chance of being enacted." Who's Who Craig Tucker Page. Tucker: "we worked with the Klamath Project irrigators, the enemies of the tribes since those guys showed up; we did work out a water sharing agreement. ...We did not solve all the problems in the Klamath Basin with these agreements. We did not get rid of all the farmers, we did not rebuild all the wetlands, but we do pull off the biggest dam removal in the history of the world...and if we're still gonna deal with water quality issues at Keno, at the end of the day, I can guarantee the Karuk Tribe and Craig Tucker will be in the front seat dealing with that next." KBC NOTE: Tucker is referring to destroying the Keno Dam which provides much of the Klamath Project with water. KLAMATH TRIBES Horse trek: Tribal members make case at capitol; ride to Salem illustrates dissatisfaction with water pact, H&N 6/27/15. "After riding horses on and off for about 250 miles from Chiloquin to the state capitol, tribal members and allies demanded their voices be heard on Wednesday. Protesters said they are speaking out against the Klamath Basin Restoration Agreements (KBRA), Senate Bill 133..."
Oregon hatcheries releasing fish early due to drought, H&N, 6/27/15. (KBC Note: The controversial proposed KBRA would eliminate hatcheries from the Klamath River which produce millions of salmon. Klamath and Siskiyou Counties, home of the dams, oppose the KBRA agreements along with opponents within the regional tribes. Klamath Tribes members to protest (Klamath Agreements) at the state capitol. Group of four rides 250 miles on horseback to visit Gov. Brown, H&N 6/24/15. “I decided to take this ride to put a lot of the (Klamath) tribal politics in the spotlight,” Bettles said, explaining that he does not believe the Klamath Tribes’ tribal council is accurately representing what members want in the Klamath water settlement package." 'We the People Radio': "Klamath Basin Restoration Agreement/KBRA" with Klamath County Commissioner Tom Mallams. Audio June 7, 2015. Mallams details: some of the closed, back-door meeting threats and blackmail; information about John Bezdek, Senior Advisor to the Secretary for Klamath Basin Matters and former Deputy Director of the Secretary's Indian Water Rights Office where he was responsible for managing 19 Indian Water Rights Negotiating Teams; the KBRA's lack of the initial goal of: water guarantee, affordable power and relief from the ESA / Endangered Species Act; lack of science and benefits plus detrimental results of destroying 4 hydro dams serving 70,000 families; the conversations and goals of the environmental groups and tribes to remove the Keno Dam which provides water for Lake Ewauna, Klamath Project and the refuges. * Land for Klamath Tribes identified. Klamath Tribes, Forest Service agree on parcel to replace loss of forest, H&N 5/30/15. *Reliable water the reason Klamath Project was built by Dan Keppen, former KWUA director, H&N 12/15/03. "The community should be assured that any sort of proposed settlement can never be implemented without congressional action, which will require a great degree of local and regional support. There is simply no chance of a "secret deal" being cut on this matter." *Negotiations regarding Tribes, Klamath Water Users, Klamath Basin Rangeland Trust, and DOI: 2003-2007, closed-door meetings where the Klamath Tribes want 690,000 acres of the Winema/Fremont National Forest returned to them again. *FOREST TOUR HOSTED BY THE KLAMATH TRIBES This is a complete transcript taken from videotape. This day-long tour was conducted October 17, 2003 for the purpose of showing to local farmers, ranchers, businessmen, and the Klamath County Commissioners, tribal biology and the proposed forest land acquisition. Some of the topics include sucker habitat, tribal traditions, thinning brush, deer-take practices, power plants, gentlemen farmers, and termination. Some of the topics include sucker habitat, tribal traditions, thinning brush, deer-take practices, power plants, gentlemen farmers, and termination. 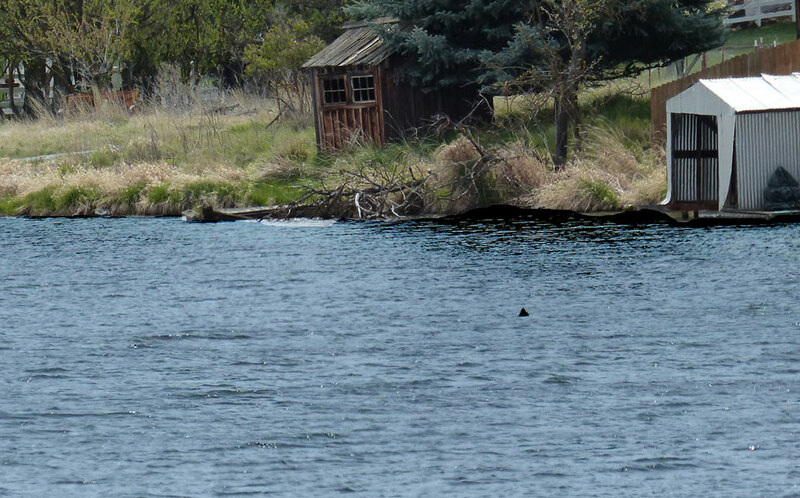 < Klamath River, Keno April 24, 2015. BOR study to tackle climate change threats. Crop modification and river restoration among options, H&N, posted to KBC 3/19/15. "Greg Addington, executive director of the Klamath Water Users Association, said any study will be incomplete unless it includes water needs for fish and wildlife...He pointed out that the Tribes should be part of any long-term water storage discussion." " Implementing strategies could improve delivery efficiency, reduce demand, reduce losses, and support water acquisition and transfers, and restoration projects, McGinnis said....Strategy examples include modifying crop use and acreage, increasing water storage, increasing streamflow, river restoration and implementing the Klamath Basin Restoration Agreement. Water settlement comes into question. Tribes remain hopeful that Congress will approve legislation, H&N, 3/5/15. "Three Basin tribes have begun a mediation process that could end in termination of the Klamath Basin Restoration Agreement (KBRA)...Family Farm Alliance, a non-profit..., has thrown its support behind Senate Bill 133..."
‘A River Between Us,’ upcoming movie by former Oregon Senator Atkinson and Jeff Martin, H&N article 1/17/15. "Atkinson is a longtime supporter of the 2010 Klamath Basin Restoration Agreement and the related Klamath Hydroelectric Settlement Agreement..." Some of the pro-KBRA stars in the trailer are KBRA supporters: Klamath Water Users Association / KWUA Executive Director Greg Addington, Becky Hyde from off Project, former KWUA president Steve Kandra, Kurt Thomas from KBRT/Klamath Basin Rangeland Trust, and others. "A River Between Us” is a “call to action on behalf of the largest restoration project in American history.” " 'We don’t draw the conclusion for anybody,' Atkinson said." KBC's Negotiation Page identifies involvement of KBRT and KWUA, The Nature Conservancy, Off Project Becky Hyde, and Klamath Tribes when this group was trying to give 690,000 acres of the Winema/Fremont National Forest to the Klamath Tribe. Here is an example of a meeting in 2003 Negotiation. After thousands of petitions against that deal, in 2010 closed-door meetings (with more tribes and environmental groups) gave birth to the KBRA/Klamath Hydrodam-removal deal and gift of 92,000 acres of private forest land to the tribes plus millions of $.